Don’t let chronic headache pain cause damage your quality of life. Headaches: Most people suffering from TMJ dysfunction suffer from headaches. Earaches: About half of all TMJ dysfunction sufferers deal with ear pain without the presence of ear infection. Noise: If you hear popping or clicking when you open your mouth, it’s generally a sign of a TMJ problem. 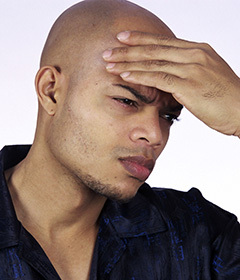 Dizziness: A good number of people who’ve been diagnosed with TMJ disorder suffer from dizziness. Ear Congestion: Some patients report ear congestion. The number one symptom that brings people to the dental office seeking help for TMJ trouble is chronic headache. With TMJ therapy from Dental Expressions near Kaukauna, WI, we can help alleviate your chronic pain problems associated with TMJ disorder. Posture problems can even contribute to misalignments of the TMJ that cause TMJ disorder. TMJ therapy from Dental Expressions is designed to alleviate these misalignments and relieve the tension in your joints. One way to combat TMJ dysfunction is with TMJ therapy that includes an NTI-tss splint to alleviate nighttime teeth grinding. The NTI-tss keeps your back teeth apart, preventing clenching and grinding to reduce the pressure that leads to TMJ dysfunction. The NTI-tss accomplishes this by minimizing the intensity of muscle contractions and encouraging the edges of your incisors to be in contact you’re your mouth is closed. We will also recommend stress management, as anxiety is often a contributing factor in TMJ dysfunction. If you are experiencing chronic problems like headaches, earaches, and jaw problems, contact our Freedom dental office near Kaukauna to make an appointment. We can discuss the possibility of TMJ dysfunction and TMJ therapy for treatment. We’ve helped patients from all over the Fox Cities, including Appleton, as well as Green Bay. The problems associated with TMJ dysfunction can serious erode your quality of life. Receive the treatment you need at Dental Expressions.